An account of resistance to shipyard closures in Puerto Real, Spain, that lead to community wide involvement, with the anarcho-syndicalist union CNT playing both a prominent and decisive role. After the Strike . . . 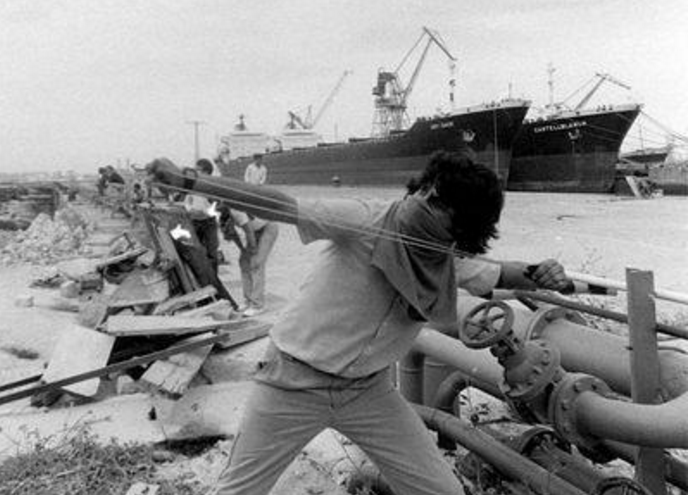 The recent struggle in and around the shipyards of Puerto Real, Spain, in both workplace and community, against threatened closure witnessed the anarcho-syndicalist union CNT playing both a prominent and decisive role. The CNT's involvement meant that the methods of organising and the forms of action taken departed from those common to reformist unions -- with dramatic consequences. When the PSOE government (socialist in name, but Thatcherite in practice, announced a programme of 'rationalisation' at the Puerto Real shipyards, the workforce came out on strike. The CNT was at the forefront in spreading the action to the surrounding population. Not only was the government defeated, but a number of pay and condition improvements were secured. In this not only did the great determination and ingenuity on the part of the workers bring results, but that of the communities too. Mass assemblies both in the yards and surrounding localities involved workers, their families, neighbours and all supporters. Initiating and maintaining entire communities' involvement in mass assemblies alone was fine achievement. By all accounts the work of the CNT in and around Puerto Real established direct democracy as an inherent part of local political culture and resistance - people deciding for themselves, rejecting control by unaccountable politicians, union officials or 'experts', ensuring control remains in the workplace and locality. Not imposed unchallenged from above, be it by boards of directors or government, local or national. Since the 1987 strike in the shipyards, other disputes, campaigns and issues have been linked-up - struggles around health, taxation, economic, cultural issues and environment have all been drawn together into activities of resistance. Here in Britain, as in Spain, we have the same problems, not only in shipbuilding across the whole spectrum of industry. Communities and livelihoods are decimated by the bosses' and government's self-perpetuating dogma of profit, profit, profit. Capitalism's ability to adapt in the face of change and crisis shows no re whatsoever for the consequences felt by the individual and society. We are, or rather we are encouraged to believe, that we are powerless to effect any real change in our lives. No political party or trade union has anything to offer but yet more bitter medicine and false promises. The crisis of society and grip of poverty only deepens. The time has come for real resistance, the building of a labour movement fights not just for higher wages and better conditions, but against the whole capitalist system. The experiences and actions of Spanish workers have provided valuable lessons in the past, but today as we approach the 21st century new ideas are needed. It is to serve this purpose that this pamphlet is published. "I would like to bring greetings from the Spanish anarcho syndicalist organisation the CNT. I hope that links between British and Spanish workers through this particular conference can be increased. Today I would like to talk about the rationalisation of the shipyards in Puerto Real in the south-west of Spain and the kind of activities the CNT has been involved in. First of all I would like to place rationalisation within its context in 1980's and '90's Spain. Rationalisation is a capitalist necessity, something which is in response to a permanent situation of needing to rationalise and change the mode of production. Capital changes its course throughout society and changes its destination in order to increase profits in certain industries, with capital not being fixed but moving around. I'd also like to point out that there is no solution to this ever-increasing process of rationalisation within the capitalist system, but rather we'll propose a revolutionary solution to the problem of rationalisation. Within this context I'd like to point out that capitalism needs certain instruments to be able to achieve a status quo. Capitalism needs its political parties, it needs its reformist unions, which have become pillars of the capitalist system itself. Reformist unions have been bred by capitalism and the mainstay of the reformist has become one whereby any kind of rebellion or questioning from a working class perspective is essentially neutralised. I don't think that I need emphasise the failings and the outrageous nature of reformist unions and the political parties, so I'll go on to talk about the specific situation in Puerto Real. There are two points inherited from a marxist perspective. First of all, marxism separates the political and the economic to try and promote the idea of economic unions, unions that deal purely and simply with economic issues, whereas the political issues are tackled by the political party. Secondly, we are left with the need to struggle against the whole culture that has been built up around delegating activities, around delegating power to others. Anarcho-syndicalism is trying to oppose these negative legacies of marxism, so that people are actually re-educated in order to destroy this culture of dependency and to build up a new kind of culture that is based on activity and action for people, by themselves. Real revolutionary organisations and real revolutionaries are not necessarily the first and should not be defined by whether they take up guns or weapons to fight against exploitation. What we are really concerned with is building an organisation whereby people can actually properly participate and make decisions on their own two feet. This we see as a much more valid form of direct action than resorting to armed struggle. I would like to illustrate through slides that through many years of education and struggle, something like fifteen years in Puerto Real, we have managed to form an organisation that is in permanent dialogue. It is an organisation which has provided the possibility of solutions to particular problems which are outside of the parliamentary arena. Every Thursday of every week, in the towns and villages in the area, we had all-village assemblies where anyone who was connected with the particular issue, whether they were actually workers in the shipyard itself, or women or children or grandparents, could go along to the village assembly and actually vote and take part in the decision-making process of what was going to take place. So we created a structure which was very different from the kind of structure of political parties, where the decisions are made at the top and they filter down. What we managed to do in Puerto Real was make decisions at the base and take them upwards, which is in complete contrast to the ways in which political parties operate. Anarcho-syndicalism, or as some people prefer, the term revolutionary syndicalism, is nothing unless it has an anarchist base. What we tried to do in Puerto Real is show that the anarcho-syndicalist union is not just an industrial organisation that takes on factory disputes, but rather has a much wider social and political aim. What we have done in Puerto Real so far is attempt to interlink various different disputes, taking on various struggles around education, around the provision of health services, cultural aspects, and we've been struggling against the proposed construction of a new golf course, the privatisation of a cemetery, we've been fighting against various local tax increases. In other words we have been trying to show that the anarcho-syndicalist union is much wider than just focusing on industrial issues. What we've managed to do is organise a movement which is co-ordinated on an ecological level, in order to struggle against these various projects which are being talked about. We have managed to link together twelve different organisations within the local area that are all interested in fighting these various aspects, whether it's increased taxes or the golf course mentioned earlier, or the privatisation of the cemetery. So again, anarcho-syndicalism in Puerto Real is not just fighting on the industrial level, but has managed to interlink all kinds of disputes of a fairly diverse nature. We have tried to ensure that this organisation, which is composed of twelve different bodies, is directed by a sense of consensus rather than any organisation imposing their particular ideas on the organisation. So we have tried to establish a system of direct democracy, whereby the organisations can put various points on the agenda and those points will be discussed. There is no central or overall control, or directing group which has the power over the rest, it is very much a federalist and openly democratic organisation. The whole conflict kicked off as a result of people at the shipyard not having work for something like five years. What the government wanted to do was shut them down completely. At the end of 1987, when the King of Spain was due to visit Puerto Real, the CNT in order to highlight the dispute, decided to block off the main road and only bridge linking Cadiz with Puerto Real - an important and strategic place. What the CNT did was to barricade the road to prevent the King of Spain from coming across. Every Tuesday was dedicated to acts of sabotage and direct action; telephones were cut off, the whole province was without telephones every Tuesday; Every Thursday we used to concentrate on the assemblies in the villages. Over a thousand police from different parts of the country came to Puerto Real to try and contain these activities. Accusations were made that a child who was on the way to hospital died because of the CNT barricades, but we always let ambulances through. They were the only vehicles allowed through. Each Tuesday we occupied the offices in the shipyard from 7am until 3 o'clock in the afternoon. As the shipyard was very large, we were only able to build barricades in certain areas. Every Tuesday as the occupation finished, we had to protect people from the police as they retreated, so comrades were up on one or two of the ships armed with catapults and other things, to defend people as they retreated. At one point when the barricades were set up on the outskirts of the town, of course they wouldn't let the police in. From the roofs of flats people would throw plant pots, fridges, tables, all old useless stuff at the coaches bringing in police. The railway line was also cut by building barricades and also felling the telegraph poles. Also on Tuesdays were the assemblies in the shipyards themselves. Any decision that was taken in these assemblies of course was independent of any official union presence or official union ideas. We managed to get a great deal of support from the rest of the CNT, of course. There were meetings that took place all over the country, from Galicia to Barcelona. There was also economic help which came across. One of the most important things, a key element in the dispute, was that the CNT was particularly strong in Puerto Real itself. So that was where most support came from. Workers who were in different industries and also different unions supported the struggle. Another important thing was that of the four thousand workers at the shipyard, two thousand of those workers were members of the UGT (socialist union) and Commissiones Obreras (communist union), and in the workers' assemblies the proposals of the CNT, in opposition to the approaches of the other unions, were always carried bypassing completely any suggestions that were made by the other unions. A very important aspect of this particular conflict was that the CNT's proposals were always accepted unanimously. After about six months of sustained activity, instead of closing they got some work for the shipyards. Eight ships came in to be refitted. That was one of the results of the sustained activity. Another achievement was a decent early retirement package at 55, where the pension would be linked entirely with the wages of those workers still working - a 100% link, equal to that of those still in work, also linked to any increase in salary achieved over the next nine years up to the age of 64. So that was quite a remarkable achievement. We also achieved a rotation of people, so that if there was not sufficient work some comrades would work for two months, others would not work for those two months. But everyone would receive 100% of their wage. After two months those people who had been working would come in. So there was rotation of work in accordance with what was available, but everyone received 100% of the wage. The shipyards are still functioning and there is a lot of work especially from the building of double-hulled ships, ecological ships, from a joint project between Great Britain, France and Spain. What we've tried to do is show people that various different problems are interlinked, such as the golf course, problems over taxes and other things. So what we've tried to do is show that for example ecological problems are not just ecological problems, but have a political and social basis. Over the last eight months we drew together these different forces and organisations for a combined project, and so far it's been very successful. It's really just a question of proposing different methods of struggle to different organisations, and the fact that they've been adopted. We have also tried to create embryonic structures of direct democracy and participation, rather than the town councillors just making decisions about health and education. All these questions have been discussed in local communities and on estates, so that through a process of pyramid-type democracy (from the ground-up), we've managed to take ideas, questions and problems up from the base to form at the pinnacle a concerted idea of what all the local areas think." What percentage of CNT members are in the CNT because they are politically committed to anarcho-syndicalism? What advice can you give to us in Britain? "First of all, most members of the CNT are there on a ideological basis and agree with the standpoint of the CNT, but mainly they will have come from different organisations into the CNT - different unions, etc. So what the CNT is also doing is providing evening classes on various different aspects, from ecology to liberalism, to democratic society, so there is also a large slice of education which people are participating in as well. On the second point, it's a bit difficult for me to say, but all I can suggest is that you do the work and you'll see the fruits". Did the assemblies just occur during the strike, or have they carried on? "There is a permanent dynamic role of the assembly, what we've tried to do over the years is build assemblies for every shift of whichever factory we're talking about that's on the industrial sphere. In the villages and in the town these assemblies still take place. About two weeks ago, around 2,000 people went to participate in the town assembly. So these do take place, but also we're concentrating very much on the estates and local areas - local assemblies, as well as the main larger one. Every week the CNT visits different workshops, different factories, taking advantage of the morning break, about 11 o'clock, to go into factories and actually discuss different things with workers, that is something else we do, going as the CNT and talking with people on their breaks". Do you have recallable delegates, and do have you ever had a case where delegate have not represented the views of the members and have had to be recalled? And we those individuals demoralised or pissed off about that? What did they feel about: being kicked off a task? "No one has ever had to be recalled, however if any delegate did go against the decisions taken in the assembly they would be recalled and also expelled from the union. But each delegate is there for a fixed period of time, either six months or twelve months, but no one has ever been recalled because no one has ever gone against what's been laid down in the assembly". Considering what you have been doing, what has the state done to stop you? "One of the things that took place was in Adra which is further east along the coast the CNT was accused. - some of the members were, of having taken part in a hold-up in Adra. This was used as an excuse to arrest CNT members and try to crush the union, but since 1977 when the CNT was again legal (following the death of Franco and the end of the dictatorship since 1939), it has been the victim of several different plots, and different acts of repression in order to eliminate the union. What we concentrated on also was that any acts of violence, or direct action, would involve the whole village itself. We did not set ourselves up as a vanguard group that would go and do these things. We involved the whole village, the whole town or whichever people it concerned, to do that. We were not a vanguard organisation, any violence or direct action taking place was essentially carried out by everyone. I was accused personally, and other comrades, of various things, having caused damage up to the value of 15 to 20 million pesetas, and also I had my telephone tapped and various things like that. But those were things that happened to me, and things happened to other comrades as well. So there was a concerted effort to criminalise the members of the CNT, especially those in prominent positions." The CNT, Spanish section of the International Workers' Association, has been in existence throughout the 20th century. Up to the coup of General Franco in 1936, the CNT was with over 2 million members the largest workers' organisation in Spain. Following the death of Franco in 1976, the CNT re-emerged as a significant organisation despite being plagued for the following 15 years by many who would rather it did not exist. Today the CNT is well on the path to re-establishing itself as an effective workers' organisation across every region of Spain. (1). See following pages for further details. (Taken from "Icaria", a CNT magazine. "Icaria" spoke to the women who had organised independently of the men and played a big-part in the struggle). Icaria: How and why did the women of Puerto Real start to take part in the shipyards' struggle? Spokeswomen: It started when a woman saw that we were all worked up because on Tuesdays our menfolk were confronting the police and suffering from repression at the shipyards while the media called them all terrorists. This woman took the initiative, contacting neighbours and friends. In turn, they contacted many groups of women and they went out with a megaphone every Tuesday to demonstrate, meeting other women affected by the shipyards problem. At that time the men carried on the struggle inside the shipyards but the problem affected us as much as them. They were not so much demonstrations of support but our own because we depended on the men's wages. I: Why did the struggle develop independently of the men? SW: Because the were not here - they were in the shipyards which the women weren't able to enter so our struggle was in the town. On Thursdays when the men brought the struggle into the town we went together to the demonstrations and in this way we could create quite a large group of autonomous and independent women. I: What type of organisation did you have in the group? SW: A co-ordinating committee of 6 women was elected but they didn't take decisions of any kind. Their function was only to co-ordinate. The decisions were made by the assembly on Wednesdays where proposals were made and voted on by a show of hands. I: How many women were there in the group? SW: The number varied - we started with 100 and grew to 500. The crossroads where the motorway, National IV, ends, was the symbol of our struggle and where we went to block the motorway. I: Were there any women in the 'collective' who were not dependent on the wages of a shipyard worker? SW: The majority of women are from shipyard workers' families. However there are women from other backgrounds in the collective. I: Was this the first experience of direct action the women had had in the streets? SW: Yes, within the context of 6 women's collective. I: What did they think of the violence reported in the media concerning Puerto Real? SW: What did we think of the violence? The only violence here was that by the police and it was very heavy. It was heaviest around the 'Cartabon', which was our 'Hill of Martyrs'. We were a totally independent and autonomous collective. We want to say that we weren't treated gently by the forces of repression because we were women.. Our struggle was not only on Tuesdays but a daily struggle with the 'forces of order'. We tried to explain this to other women to get them to understand. We received support and telegrams from feminist organisations, associations of political prisoners and the Assembly of Women in Cordoba...However there still remains a lot to do. Q: Now you've won some concessions notably construction of a ship, won't this risk demobilising the workers? A: Since the last general assembly called by all union sections (CC.OO, UGT, CNT, CAT) on July 9th we've broken relations with the others as they wanted to sign a worse agreement than previously. We decided to continue the fight and prepare a general strike throughout Cadiz industrial zone. The following week we called an assembly attended by 1,500 workers. Workers well understand the contract is due to their struggle. As other unions and the works committee no longer want to call assemblies the contract will give the CNT a few months' respite... to hold meetings throughout the district, with slides of the struggle and to denounce the agreements signed and other unions' refusal to organise assemblies. We want to show that 1 ship means nothing... Once we've covered all of Puerto Real we'll call a general assembly of the population - if other unions don't join us (we'd like to call it together) we'll denounce them and do it in the CNT's name. We want it all to coincide with what will happen from October, November and December onwards with the thousands of workers whom 3 years ago the government promised and signed new jobs or reinstatement if they agreed to go on the FPE (National Fund for Promotion of Employment - workers would be paid 80% of basic pay for 3 years). As we know they can't keep their promises we can expect important struggles throughout the country. Q: Nationally, what precisely do you see happening given the UGT and CC.OO remaining the largest unions? From this the CC.OO particularly, will expose its contradictions. For example in the ASTANO yard (Asturias) the majority of workers are in the CC.OO, which will have to call an assembly and if, simultaneously, we do information work and our call is sufficiently solid and united, we can develop a strategy of direct action in the affected areas -something that is difficult to do alone. Q: What makes the CNT's actions so difficult? A: When for example, we called the last workers' assembly in Puerto Real alone there were cops from all over Andalucia, sent by the civil governor. From the start all acts of terrorism, vandalism, violence, etc have been blamed on the CNT. When we made a call alone the governor seized the opportunity to hit our organisation hard. We must be careful, especially now, to maintain momentum, not to get isolated and avoid police set-ups as have happened before. Most importantly for the CNT in Puerto Real is that the struggle and radicalisation continues to be taken up by the workers' and community assemblies. Our role is to organise the means to defend all workers. Our outlook is that after this summer the struggle will broaden but in the future, on the fundamental question of re-deployment, we won't succeed. The balance of forces today favours the Socialist Party who can rely on the UGT to dampen down social protest, and the CC.OO who give the impression that it's radical but in practice prepare the ground for the Communist Party and its electoral project within the 'United Left'. Thus they need to demobilise workers so that they remain dependent on politicians and their sales-pitches. However they are in a deep financial crisis in maintaining their bureaucracy. Although, if on the fundamental question we don't succeed, the conflict creates a revolutionary dynamic - many CC.OO comrades have torn up their membership cards and joined the CNT. It's clear redeployment is worldwide and that today's situation favours capitalism. The exemplary struggles waged by workers over the last 10 years and the fact they've seen in practice how they are manipulated, frustrated and betrayed forms a base from which we can grow and build real workers' organisation to resist the state and bosses. That is brilliant of you to do a chinese language translation, i often worry about how western centric syndicalism can be. Its so important, because asia is an absolutely key part of global capitalism, and i feel like western syndicalists often neglect this.